BrunchWeek continues with even more delicious recipes. 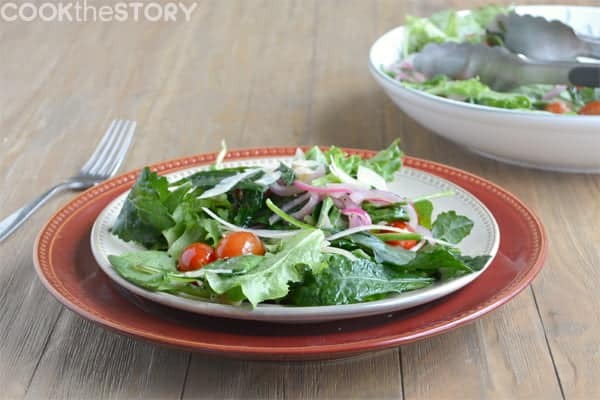 Today I’m bringing you a warm salad recipe that you can serve for brunch (or anytime!). I’ve shared the basic warm salad recipe below as well as two interesting (and extra-delicious) ways to serve it up for brunch. But first, how The Simpsons led me to make a warm salad in the first place…. I haven’t seen a lot of The Simpsons episodes. Sure, I watched back when I was 12 and it was the new rage. I think I even had a Bart “Don’t have a cow, man” t-shirt. But as an adult, I’ve rarely watched the show. Or thought about it. Except for one episode that had a catchy little tune. I saw the episode during my first year of college and that song has stuck with me. That silly stupid song. I swear it’s in my head every time I’m making a salad for friends. You see, when we’re having people over and I decide to do a salad as the vegetable, I worry a bit. What if they don’t like salad? What if they would have preferred a nice warm cooked vegetable? What if Homer and Bart were right??? And then the song is stuck in my head and I find myself tossing my boring salad while shuffling a conga along the kitchen floor. It worked! I’ve done a warm salad for every single guest who’s come through our door in the past 6 months, including two groups of people that I didn’t know (in person) before the night when they ate my salad. In both cases, they left my house still liking me. And so, I now have proof that you can win friends with salad, it just has to be a warm salad, one that might even be good enough to convince Homer and Bart. The basic warm salad recipe is below. 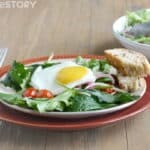 Top that salad with a fried egg (like pictured above) and serve it with my Sausage and Onion Bread and you’ve got yourself a brunch entree. 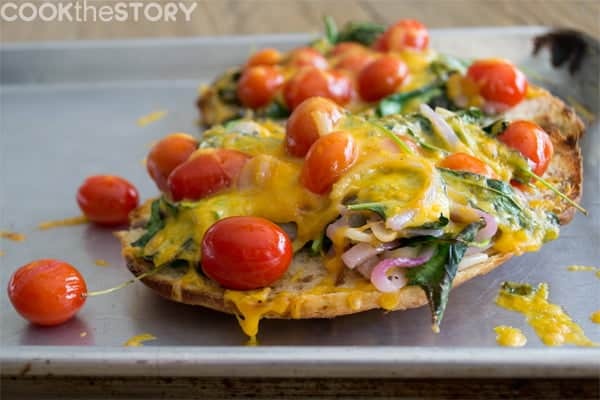 Take it one friend-winning step further: Put the salad onto the bread, top it all with cheese and broil until melted. Soooooo good. (The bread in the picture is the Sausage and Onion Bread again. The cheese is aged cheddar). Note that you can even make this sandwich leftovers from the warm salad. The leaves are a bit limp the next day (because they were wilted by the heat) but that wiltedness is what you want in a broiled sandwich anyhow, right? And now here’s my recipe for a basic warm salad. 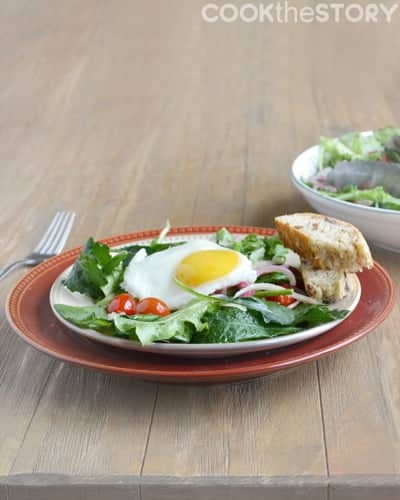 Top with a fried egg for a simple brunch dish or slide the warm salad onto bread and top with cheese and broil to make a spectacular open-faced sandwich. Oh, and if you enjoy serving (and eating!) 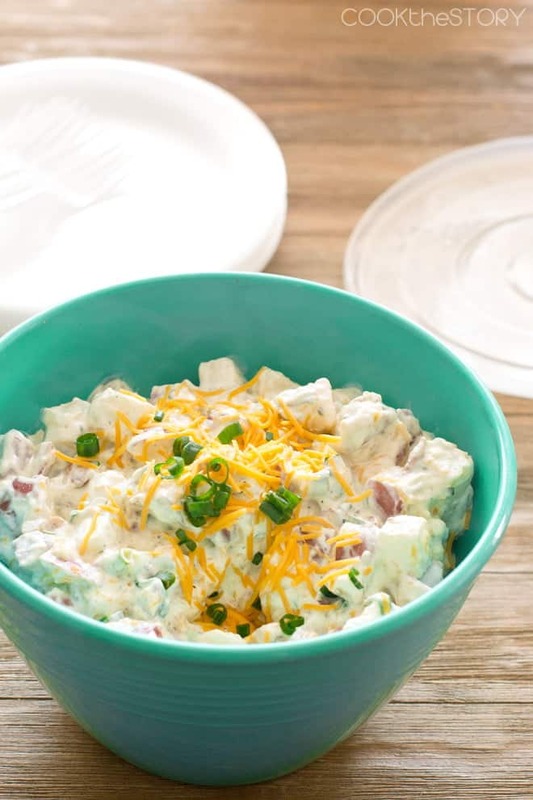 salads for brunch, you should also check out my recipe for loaded baked potato salad. For this salad I use one of those mixes that is sold in a clear box. The mix I like is of baby kale and other dark greens. But you can use straight-up spinach or any other dark salad green. In a big pot (I use my Dutch oven) combine the olive oil and garlic. Warm it over medium-low heat until it really smells like garlic but hasn't browned, about 3-5 minutes. Turn the heat up to medium-high and add the grape tomatoes and red onion. Use tongs to toss it all around just until the tomatoes are heated through, 2-3 minutes. Remove the pot from the heat and add the mixed dark greens, the salt, pepper and lemon juice. Quickly use the tongs to toss it all around, coating the greens with all that good flavor and then immediately transfer it all to a serving platter. Sprinkle the Parmesan shavings over top and serve.